STATE COLLEGE, Pa. — Tom Izzo wasn’t impressed with much of No. 6 Michigan State’s double-digit victory over Penn State. The Spartans built a big lead early and dominated at times in the paint in their 71-56 win on Sunday. From Izzo’s standpoint, that’s all they did well and that won’t be enough for the Spartans to be the team they want to be. 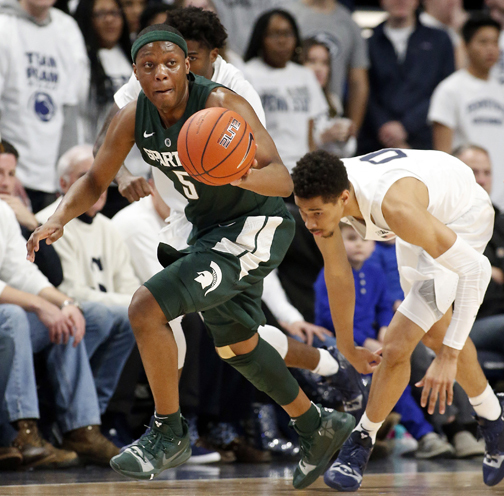 Playing without guards Joshua Langford and Kyle Ahrens, Michigan State’s offense suffered through spurts of inconsistency while also mounting the runs necessary to keep the game out of reach. Kenny Goins added 10 rebounds for the Spartans, who only trailed for 10 seconds and led by as many as 21. Fueled by a pair of offensive rebounds from Goins and Xavier Tillman, the Spartans controlled the ball for nearly 40 seconds and took the lead for good when Winston pinpointed a bounce pass through traffic to Goins, who finished with a right-handed dunk.